Olive brown to dark gray turtle with a highly domed, oval shaped carapace. The carapace is often covered with a camouflaging layer of algae. Have two bright facial stripes beneath their eyes and small, tentacle-like sensory extensions known as barbels on their chins and throats. The lower shell is small and has a single hinge which enables the turtle to partially close and protect itself. Diet: Eats earthworms, snails, clams, crayfish, crabs, insects, tadpoles, fish and fish eggs. Also eats some plant foods like algae. 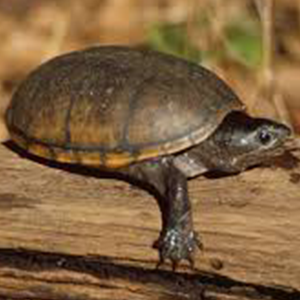 When threatened, the common musk turtle may bite and scratch fiercely. Worse yet, it may spray its musk – an odor so vile, it has earned this turtle the nickname “stinkpot”. Walks on the bottom of the stream or pond instead of swimming like other turtles.